Braided rag rugs are hand or machine manufactured from a variety of fabrics and woven to form beautiful designs to suit a wide variety of decors. 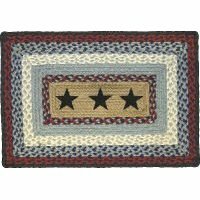 Although they are particularly suited to a home with a country theme, braided rugs are versatile enough to use in any home and in any room of the house. Braided area rugs were traditionally hand woven in round or oval shapes however, the popularity of these rag rugs has resulted in a wide range of shapes including octagonal and square. Outdoor rag rugs are becoming more and more popular. Suited to patios and pool areas these area rugs not only provide a stylish look to your outdoor area but also offer a soft surface to walk on. A round outdoor braided rug is particularly attractive under a patio setting. Many braided rag rugs are machine or hand washable making them ideal for a children’s room or play area. Braided kids area rugs made from nylon or polypropylene are durable and are easy to keep clean and your kids will love the bright designs.